Relief Week 2017 saw around 120 Goats and more than 1000 chickens donated to selected families, thanks to the generosity of our donors. Here we share a little more about why we chose to focus on chickens and goats – and how these donations are impacting our recipients’ lives. 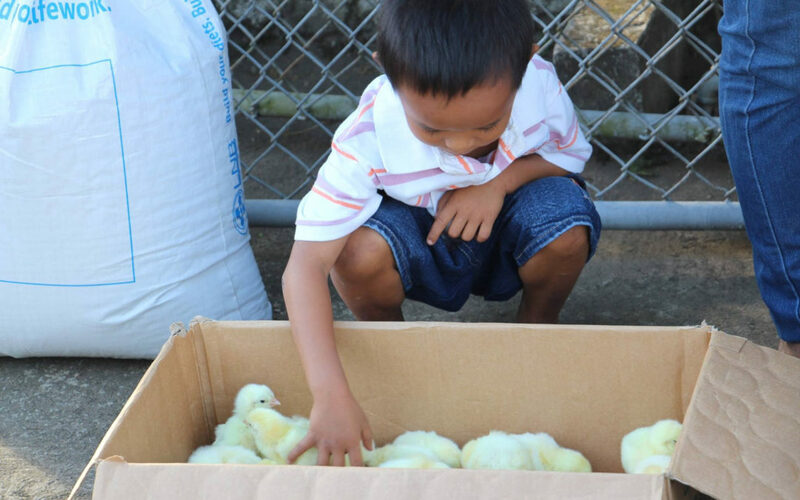 Around 1000 chickens – and the feed and vitamins necessary for their growth – were donated to selected families across Batangas during Relief Week. Since then, we’ve seen families double this number, raising more than 2,500 chicks in total by reinvesting in new chicks after each growth cycle – exactly what we had hoped for. Many continue to raise chickens even now, and we expect many will continue to do so for a long time to come. Similarly, more than 60 families received a pair of goats. Those goats have produced a large number of kids. We have worked closely with those families to take the first kid born and pair it with another and give that couple to another family in need – expanding the number of those we can help all from a single donation. While our intention behind giving away goats and chickens was to provide families with the opportunity to establish ongoing livestock or poultry operations, the variety of ways in which we have witnessed these families develop their own operations has been a testament to the true entrepreneurial spirit that Relief Brigade strives to foster. One family raised the chicks we gave them, sold them at market and reinvested the funds to purchase two piglets. Another family did the same but invested in goats. One recipient used the proceeds from the chickens she raised to open up a small convenience shop on the side of the road. Our team on the ground checks in regularly with the recipients of your generosity, and the results are good! For example, Emily, a single mother of three living in Batangas, initially received a donation of 32 chickens. She raised them well – they grew bigger than the average size and within 40 days she took them to market and received more than 6,000 pesos. She used some of the profit to put food on the table for her children and the rest to reinvest in more chickens. She has shown a true business mind since, learning more about the market, such as when and where to buy and sell the chicks to get the best prices, which has allowed her to buy more and more chicks each growing cycle. She continues to grow the number of chickens she raises and at last count was raising close to 40 every cycle. Regardless of the particular path chosen by the recipients, all of them have used your support towards building an ongoing source of income and economic security – definitely not a handout.